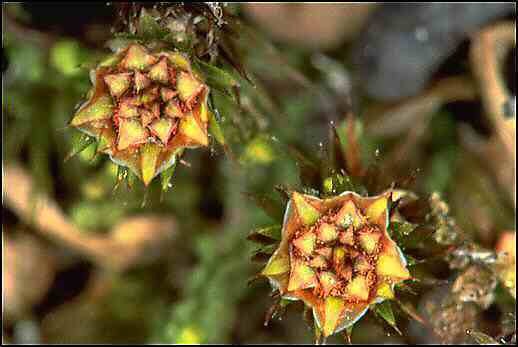 Polytrichum plants shown on this page all have a cup on the top of their stems that typifies the male plant. Inside the cup are tiny antheridia (sperm producing sacs) that produce biflagellate sperm. The cup composed of modified leaves is called the perigonium. The antheridia grow in the axils of the perigonial leaves. 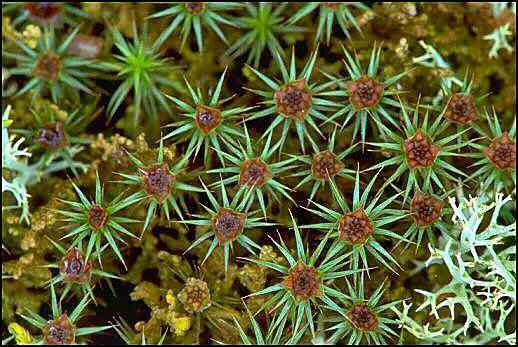 Moss sperm can swim through a thin film of water to reach the female plant. This process is helped by rain splashing into the perigonium and also by insects which can inadvertently carry sperm on their bodies. 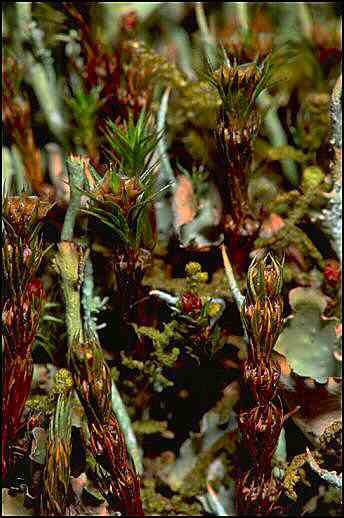 These male polytrichum, intermixed with liverworts and lichens, produce a new perigonium each year. The stem continues to grow in the center of each perigonium. By counting the number of cups in the stack the age of some of these plants is seen to be in excessof five years old. This enlarged view of the perigonium shows the tiny antheridia, resembling fine hairs, growing between the perigonial leaves.